There’s no getting around it, so let’s start with the bad: Dishonored 2 is busted on many, many PCs. That said, it's lightly less busted after installing the new 1.2 patch that released on Tuesday. But things still aren’t great by any means. I’m still seeing wild frame rate swings, from 100+ down to 50 on Ultra settings with a GeForce GTX 980 Ti at 1080p, depending on where I am and what I’m looking at. Worse is that the settings still seem like window dressing. Frame rates stay almost exactly the same regardless of whether I’m on Ultra or Very Low, and the game relies on console-style upscaling as a crutch. Taking a look at Reddit and Steam reviews, it seems like some people are having zero issues after the 1.2 patch, while others say the game doesn’t even start anymore. It’s a mess, and so as we did with Batman: Arkham Knight not so very long ago, we’re throwing a provisional score on the game. When it’s fixed, we may revisit our rating. I think that’s about all the discussion we need of Dishonored 2’s performance problems. You know it’s broken. I know it’s broken. It’ll (hopefully) get fixed. Should it have been released this way in the first place? Absolutely not, but what’s done is done and I guess all we can do is shake our heads and be thankful for Steam refunds. 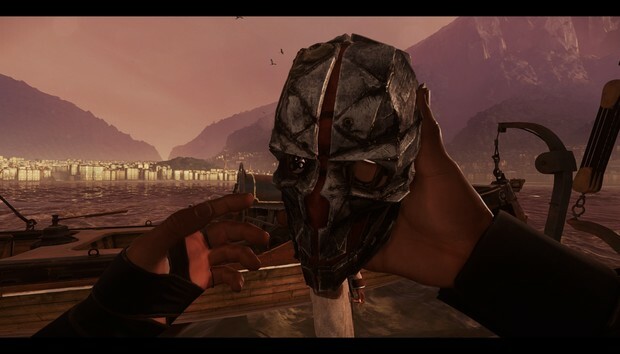 It’s a damn shame because aside from its frame rate woes, Dishonored 2 is a pretty good game. Like its predecessor, Dishonored 2 is either a Thief-esque stealth game or chaotic shooter, depending on how you play. I chose to play the former, creeping my way through the shadows and silently strangling whole armies of baddies. You’d think they’d stop checking on those mysterious ringing alarm clocks after a while, but no. Set 15 years after the original, young Emily Kaldwin’s grown up and taken over as Empress, while the now not-so-silent Corvo Attano (voiced by Stephen Russell, a.k.a. Garrett from the oooold Thief days) keeps her safe and sound. Except he doesn’t. Corvo, playing his role as maybe the most inept guardian of all time, fails to stop yet another coup, and with Emily frozen in stone it’s up to him to untangle yet another conspiracy. Of course that’s not the only way to play. It could be Corvo who’s frozen in stone, with Emily loosed upon the world with her own set of unique powers—the ability to turn into a shadow-being, the ability to leap like a cat. After an hour or two with Emily though I found myself missing Blink, especially as a stealthy character, and hopped back to playing as Corvo. Oh well. Anyway, the whole story is a bit of a rush-job. There’s an impressive amount of “If-This-Then-That” modularity, with various choices you make resurfacing in minor and not so minor ways throughout the campaign. But the overall plot feels like a retread of the first game, except set in the Caribbean and with fewer characters to care about. And it doesn’t help that Dishonored 2 is undermined by some of the worst voice acting to ever grace a video game of this stature. I don’t know what’s going on over there, but the original Dishonored had the exact same problem—lifeless, boring VO done by a stacked cast that included Brad Dourif, Chloe Grace Moretz, Carrie Fisher, Lena Headey, and Susan Sarandon. This time around, Arkane nabbed Rosario Dawson, Sam Rockwell, Pedro Pascal, Jamie Hector, April Stewart, and then had them snooze their way through their lines like they were auditioning for characters in Dark Souls. The aforementioned Stephen Russell and a memorable performance by Vincent D’Onofrio are the lone exceptions. The game rarely shuffles you through linear story segments though—only at beginning and end of each mission, basically. The rest of the plot, in stealth game tradition, is hidden in dozens of notes scattered across the game’s levels. Here’s where Dishonored 2 wins marks. Perhaps the most disappointing aspect of the Xbox One/PlayStation 4 era has been its willingness to rehash the Xbox 360/PS3 generation. This can be blatant—an ever-growing list of “HD Remasters” serve testament. But far more insidious is the way popular genres have stagnated, with shiny new coats of paint slapped over the same old tired structures we’ve seen since 2007. New console generations have always arrived alongside boasts of shinier graphics, sure, but there was a time not too long ago when it also meant huge changes in the way we played games. Assassin’s Creed, for instance—no matter how burned out you are on the series now, the original’s release in 2007 was incredible. Such big environments! Such big crowds! It took the parkour from Prince of Persia (during the Sands of Time trilogy) and pushed it so much further. Dishonored 2 takes first-person stealth to new heights, at least where level design is concerned. Two missions in particular—the Clockwork Mansion and a separate run-down manor—stand out from the rest, though unfortunately they’re also the ones you’re most likely to know about since they were used for pre-release marketing. Still, as far as this type of Thief-style steal-everything-that-isn’t-nailed-down stealth game goes, Dishonored 2 is a masterwork. Let’s just dissect the Clockwork Mansion for a bit. Like all great stealth levels, the Clockwork Mansion appears rigid at first. You enter through the front door (not so stealthy) and find yourself in a cramped foyer, with apparently no way out. This last bit is where the Clockwork Mansion impresses most. See, the mansion gets its name from its structure—one that changes with the pull of a lever. The entry hall you arrive in? The one with “no way out”? You pull a lever and suddenly everything moves into action—the walls lift away and fold back, the ceiling flies upwards, display cabinets rise out of the floor, bookshelves line the banisters. This particular common mind? Turning away from the parading Clockwork Soldier, an eight foot tall robot whose scythe-like hands wanted nothing more than to remove my head from my body, I slipped behind one of the shifting wall panels into a tiny gray corridor. Pull a lever and a bedroom emerges from a featureless wall, a blocked passage opens to unseen depths, paintings you’d swear weren’t there a minute ago now glare down from the walls. A small library even sinks slowly into the basement, its two civilian occupants perplexed by the dismal change of scenery. It’s not that the Clockwork Mansion couldn’t have been done on previous consoles, let alone on 2012’s crop of PCs. But in terms of both creativity and technical prowess, the Clockwork Mansion just feels “next-gen.” Where so much of Deus Ex: Mankind Divided felt like a quest for the next inevitable air vent, the Clockwork Mansion takes the same well-worn trope—that of the “spaces between the walls”—and does it up on a scale we’ve never seen before. And sure, Deus Ex is a different type of series. It’s more realistic, more restrained. There’s certainly room for that approach alongside the more fantastical elements of Dishonored 2. Nevertheless, the further exploits of Adam Jensen never surprised me near as much as this one level of Dishonored 2’s tale. The Clockwork Mansion turns out to be the high point of Dishonored 2, but not by much. Each level tends to feature some twist on an old trope, some bizarre one-off mechanic that appears and then disappears from the game and encourages you to try new things. It’s a lot like Titanfall 2 in that regard, actually. Like The Witcher 3 though, there’s something to be said for questioning old forms. Dishonored 2 is an excellent Thief-style game, sure, and that alone is worthy of high marks... at least once the performance issues are sorted out on PC. But we can also use this as an opportunity to take a hard look at the genre itself, though. If there are ten paths to your objective, but the completionist player ends up going down all ten paths...does it really matter that there were ten paths to begin with? This is especially problematic in Dishonored, which highlights what collectibles you missed in each chapter, subconsciously reinforcing that the “correct” way to play the game is to explore every damn nook and cranny to steal someone’s gilded bath salts or whatever. It’s less annoying than the original Dishonored, which essentially shamed you for playing the High Chaos a.k.a. murder everyone role. Here, there are perfectly good reasons to play both stealth and shooter, and it comes down to player preference. But still, this is a seven hour game that took me thirty hours because of all the backtracking I did to steal random doohickeys. And no, the game didn’t force me to, but it does still feel like that’s how the genre works. Wouldn’t want to miss any of those collectible newspapers or throwaway audio logs, after all. Two final complaints before we wrap this up. First, it’s ridiculous that guards don’t ever look more than six feet up. Second, while the focus might (rightfully) be on Dishonored 2’s overall technical woes, I wish Arkane would do something about the game’s audio too. Dozens of times I jumped, thinking a guard was standing right behind me, only to realize by some audio miracle I was hearing the voice of a guard three stories below and a hundred feet away. It’s bizarre, and a serious weak point for a stealth game that relies on you being aware of your surroundings. Okay, a third complaint: The Outsider is even more like an emo teenager than he was last time around. I just don’t understand that character choice at all. Dishonored 2 understands level design. That’s the takeaway here. Not much has been changed, especially if you’re playing Corvo. It’s just a bigger, bolder version of Dishonored, one mastercrafted stealth gauntlet after another paired with some excellent gimmicks. Oh, or it’s a shooter, if you want. But yeah, it’s mostly a fantastic stealth game that deserves better than its generic plot and terrible voice work. It’s a shame the game runs so poorly for so many people, as I just cannot justify giving the game an excellent score when seemingly half the audience (or more) is having issues. We’ll reexamine things once Arkane releases some patches, but for now? Buyer beware. If you must give it a go before the game’s fully fixed, snag it on Steam so you can take advantage of that two hour refund window if you need it.